Wizarding Faire ends in mere hours. This is the final day, but I couldn’t resist showing a few last goodies! This adorable dress is from The Little Bat, and it comes in various colors that represent the various houses of Hogwarts. I’m wearing the Gryffindor (or “lion”) colors. Anya Ohmai outdid herself with the creation of these adorable nifflers. Nifflers, as you may recall from The Goblet Of Fire, are adorable little treasure hunters that Hagrid introduces his students to during Care Of Magical Creatures. As you can see, there are many different options, both for rezzing and holding (there’s a second pose for holding not pictured here), and they come in a variety of colors. They are truly adorable, even if you’re not a Harry Potter fan (though that idea makes me sad, lol). My shoes are a new release from fri.day, available at Shiny Shabby. My hair is from Wasabi Pills, for the current (and soon to close) round of FaMESHed. I also promised in this post to show you the inside of the adorable little build Larkham & Co. did for Wizarding Faire. The stained glass windows are so lovely. 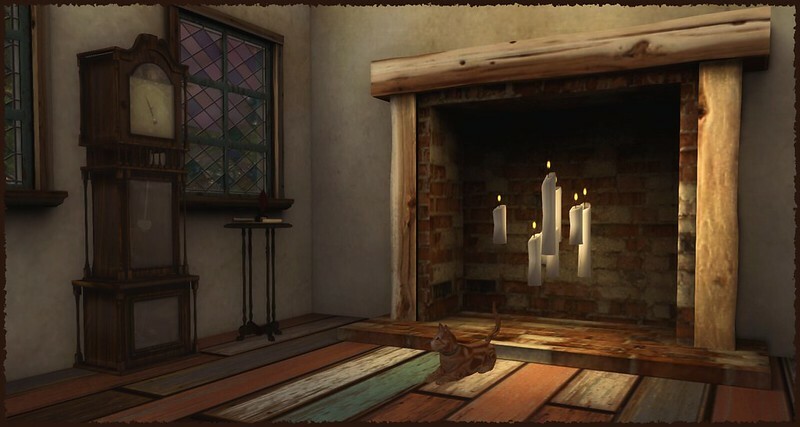 The fireplace is empty, and I thought it a perfect place to rezz the floating candles available in The Little Bat’s Wizarding Decor gacha. These actually move, by the way! Also available at Wizarding Faire is this incredibly cool clock from EDYN. It’s based on the Weasley Family clock in the books. Like that clock, you can feature family members on this one! It has a hud and easy instructions, and it’s just SO COOL. So go check that out, along with all the other goodies at Wizarding Faire, before the magic comes to an end later tonight! I was inspired by Peqe’s beautiful gown from The Conquest. I have this gorgeous build from Dysfunctional Designs, and it’s a skybox with a surround which I just love because I can just rezz it and use it right away without worrying what’s out the windows! 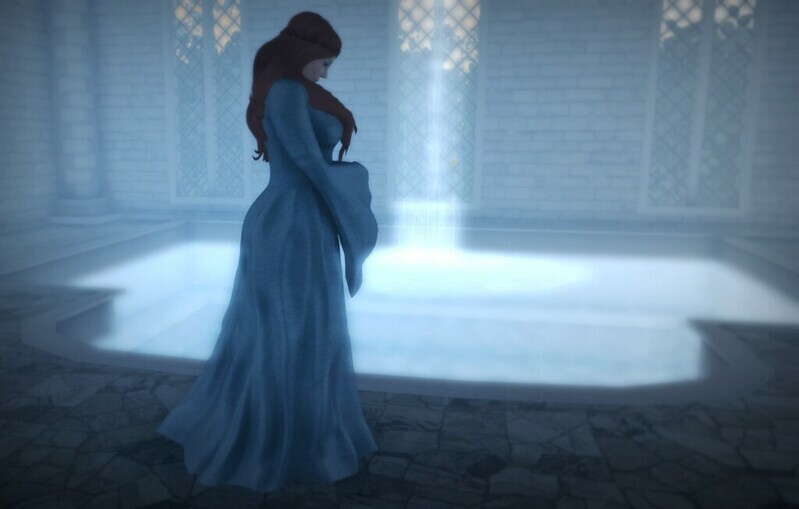 In this case, there’s also this gorgeous water feature built right in, and I knew it would be a perfect scene for this lovely dress. I am wearing one of the new releases Wasabi Pills has for The Conquest, and Cae’s gorgeous necklace which can be found at the event as well. The skin is from Glam Affair, another makeup of Eles, which I previously blogged here. This skin is a gacha, available at The Conquest, which I always like because I can pass off extras to alts. I should note that this dress has the arms positioned this way (and your arms will need be completely alpha’d out to wear it), so the poses I’ve used are not represented in their true form.